The growing use of the internet makes more and more people set up a site for their needs. Establishment of a place can start from small business individuals to large companies. Each website has its own goal in the making. If the site contains only a company profile, it will be the less aggressive attack. However, different when the website provides relevant information relating to databases and other information services it will be more vulnerable to DDoS attacks. Distributed Denial of Service (DDoS) attack is an attack that threatens the system of a network. Attackers usually have different ways to run DDoS attacks. The purpose of the attack is also varied which is more precisely known by the attackers. The impacts are diverse, from slowing down the service process from the website to the website level cannot be accessed at all and must be offline for a while to make some improvements until the site back to normal. The value of losses incurred by website owners varies depending on how severe the attacks are. The amount of damage is also affected by how vital the services provided by the website. If the site classified in e-commerce then a day online website will make a high loss value. The use of site protection services is still considered to be less cost-effective. The attackers usually use the latest technology to carry out attacks. Thus, this type of attack is not entirely predictable. Besides, to be able to predict then each protection system should also update the technological developments. The use of the Internet of Things (IoT) is also one of the great opportunities to create an attack on existing sites. IoT encourages even greater assaults than previous attacks. Overcome this, then the team’s gladius is present to provide a solution to the threat of DDoS attacks. Gladius uses a decentralized system of blockchain technology concepts to develop appropriate security systems and affordable costs. The plan, Gladius will be a website protection service provider that can cover all aspects. Gladius will protect the budget owned by the founders of the website. The budget can be adjusted to the type and importance of the site. Gladius Development will be a protection platform from the first DDoS attack offering token use in it. Gladius tokens can also be obtained in pre-sales in ICO events. This token is used as payment for services desired by the user. With token ownership, it will make it easier for website owners to reach an agreement regarding the security provided for the site. To follow the development of Gladius Platform, you can visit some of the following links. Rapid industrial growth will encourage high usage of CDN services. The CDN market provides services within the Gladius platform that Gladius token holders can choose. The speed of users within the platform becomes one of the factors that can increase the growth of the CDN industry. The user’s demand for a fast connection to the site has been significantly improved. CDN will be a beneficial business service to improve access speed of material. Consumers who access the website would want speed in the process of receiving responses from the site. That encourages website owners to continue to increase access speed significantly. The need for information can continue to improve until consumers leave the retail site if access to the site is getting slower. With CDN, the speed of data will increase to give satisfaction to each customer. The speed of information supports the growth of businesses that have a good relationship between consumers and producers. Gladius offers CDN services to improve the quality of information and access speed for site founders. Sales figures in e-commerce can also increase if the site has many benefits that can enhance physical sales. CDN quality will continue to improve to provide the best service to every customer. CDN needs will also increase as the online site usage grows. From the various obstacles experienced by the providers of the site, the common problem that often happens is the fear of a slow system and the level of site security. Consumers will undoubtedly complain if access to a site is prolonged. That will make the consumer leave the place and choose to use another site that has a higher access speed. The use of CDN can speed up access to the site so that consumers can more trust your site. Site security can also be ensured by using CDN services on the Gladius platform. Consumers can be mapped to consumers who choose the speed because they prefer the quickness and consumers who need speed. Website websites with speed can make it easier for users to continue using the site in search of information. Access speed is one of the factors determining the high usage of a website. Consumers will choose to use the site with the fastest access time because it will be more efficient the time and the desired information will be quicker to accept. Access speed is mandatory for site founders. In e-commerce transactions access speed is one of the keys to its success. Gladius Token (GLA) is a payment instrument that applies within the system. Token creation will be made as long as it is available for use in the Gladius network. The sales system will be launched in public token sales events. DDoS and CDN protection services can be enjoyed by users with a purchase process that uses GLA as payment. The reserve bandwidths leased by individuals and storage space will be a cost allocation with substantial funds. Funds obtained from the use of the services will be returned for protocol development. Demand and supply will be subject to change of denomination fees in GLA. Network support owned by node owners will allow the network owners to gain incentives in the form of GLA. The platform will pay each owner for work done on the official platform. Mining with blockchain technology will be assessed by a system of shared storage space and bandwidth rather than proof of employment and ownership of the currency as a stock proof. Tokens can be designed in such a way as to allow the growth of Gladius networks to be a better platform for providing site protection services. Token sales will be opened to speed up the platform development process. The commission to be given to each owner of the node will be viewable in a currency other than GLA. Initial issuance of sales will consist of 34,000,000 GLAs with maximum issuance totaling 48.2 million GLAs. Maximum token stamp in the market is worth $ 12.5 million, and the specified maximum market cap is $ 20,500,000. Gladius network development is inseparable from the role of several parts of the platform. Centralized databases used in storage services and proxies and costs will use blockchain Etherum. Traffic distribution can keep the client chain to take action. Part of the CDN can help process the chance of content in the presence of the Gladius platform. Custom proxy is possible to do as a service in the platform. Each function used can be negotiated using an intelligent CONTENT and a GLA token. Gladius network development can be done by collecting contributions to the sale of tokens. Details of the use of funds have also been made for each buyer to be clear about the allocation and function of the money provided. Details of the use of funds can be obtained through a white paper that has been prepared by the team of developers Gladius. With clear usage details, it is expected that GLA sales events can take place smoothly and achieve maximum sales token targets. The core development of the Gladius platform will earn an allocation fund of 40% of the total sales. This amount is the most significant allocation of money in the platform. 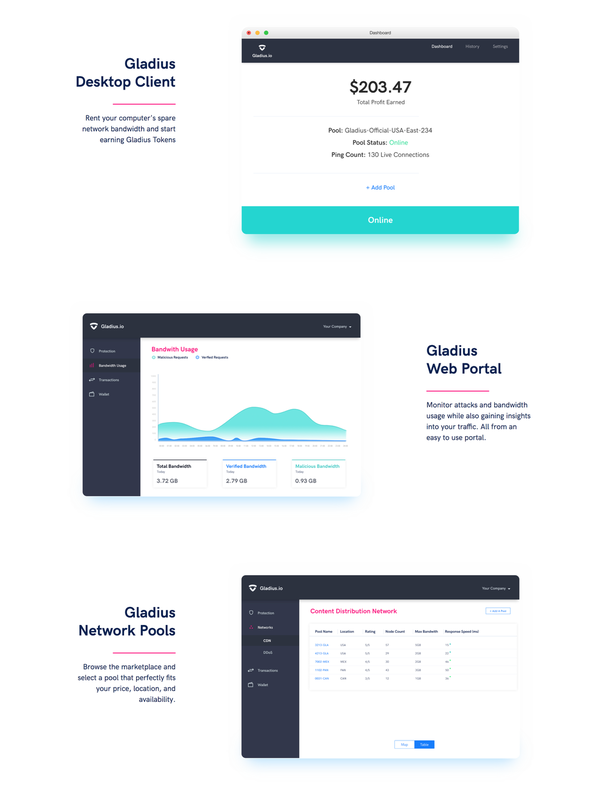 Such developments are included in Gladius services such as network nodes, intelligent DDoS protection, smart pool nodes, protocol and system support, end-user application creation, smart contract systems, and other service products. The higher the incoming funds will enable the completion of product development can be done as much as possible. Besides to the core development process, funds will also be allocated by 20% to support security. The purpose of security is to improve the protection system. The encryption process will be encapsulated for the use of nodes and DNS obfuscations. Besides, 20% of total token sales will also be used for operational costs that include the price for the company’s daily functional. Activities involved in funding operations are hosting, personnel, management, outsourcing, and infrastructure. Besides 10% will be used for law and marketing respectively. Consultations and legal advice are necessary to achieve compliance with the many technical regulations. A legal undertaking would be very safe because it does not oppose government regulations that have been enforced. Synergistic partnerships and platform marketing are essential, so they need to get the budget. The broader the reach of marketing, the more websites and nodes that use Gladius services. Pre token sale is made to show the Gladius network concept and maximize the creation of services provided to the users of the platform. Storage space and bandwidth can be obtained easily by users who have participated in the platform. Firewall rules are used as a basis for DDoS protection for each site that is incorporated in the Gladius network. Additional features are also possible to provide to network users who can depend on the number of tokens sold. After the token sale expires, there will be a resolution to solve the CDS iteration and the DDoS protection network. The settlement will achieve the result of site access speed up to several Gbs in one second. Multilevel protection is also possible to do if access speeds can be improved. The network will be fully resolved and commercialized so that any site founder can use the service to safeguard the site from DDoS attacks. Systems can upload thousands of websites at once with validation values to keep site performance in line with applicable standards. The platform development process cannot be separated from the cooperation built between traditional DDoS and CDN protection. That is probably done by creating a proxy that is on the internet and open website. Gladius made networks are different from regular networks. The difference lies in the system of pace cache and file traffic. Nodes in the Gladius network will form a pool that can classify based on the highest value of the experience of network speed. The IP address of the server is one of the essential components in DDoS protection performed by the Gladius network. Reputation will be built to prevent the formation of a hot pool by reaching a final proxy mask. CDN can be fully functional with the ability of the node to perform key caching as well as provide content to clients who are nearby. The location determination is based on the DNS server so that the node will always be sent to another node that has the closest distance. In Gladius, the database from the pool will be maintained in the blockchain. That will make the process has inherent costs and fixed costs. The Etherum smart contract started a request to join the platform. The reputation information, maximum cache, location, and bandwidth will be stored in the database. The area can be accepted by each node so that the pool can be selected which is near and appropriate to the needs. Network security is a critical determinant of the sustainability of a site. DDoS attacks that have been feared by the owners of the site can now be handled and avoided with a gilded in Gladius which is an innovation blockchain network. This platform provides comprehensive website protection services from DDoS attacks and can improve site access speed. You may be interested in contributing to the pre-sale token so keep up with the platform development information so you can participate in the token sale period.